The beautiful wood floor and simple furniture provides a nice beginning to decorating this room. What do the homeowners need to add to finish the décor? Let’s take a look at the options. From a furnishings standpoint, the sofa is a good choice for seating needs, but an oversized chair or loveseat would be a great addition for more seating options. A coffee table and side table or two will provide places for drinks and snacks and give the room a more polished look. The choices are varied. 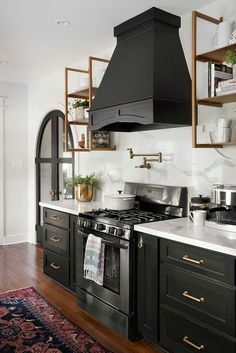 They could choose black to help the other furniture pop, a darker wood to create a more cohesive look, or even glass and metal to show off that beautiful floor. The feel of the space leans toward modern, so simple lines would work best. The next issue is color. The green pillows and throw point the room in a specific direction. Neutral colors such as blues and even a sprinkle of yellow could be added to stay with the white-based color palette. More green along with black would provide a daring approach to color in this room. A brightly colored area rug and some art will help define and enhance the color approach. Finally, a sprinkling of accessories allows them to make the room totally their own. Whether the choices come from some favorite pieces inherited from a grandmother, a few hand-crafted items collected on various trips, or just an appealing vase from the shop down the street, accessories help define their taste and portray their style preferences to friends and other visitors. The most important step, however, is to take time decorating. Find the elements that suit their sense of style and let each purchase help point them in the direction of the next. That’s the best way to create a room that works for them! Quick-Step’s design partner Erinn Valencich recently presented free decorating and design seminars at Century Tile location in Mundelein, Ill. The seminars, which were sponsored by Quick-Step laminate and Century Tile, focused on creating big stylistic changes on a tight budget. Attendees were encouraged to bring photos of a room that they wanted to refresh. Valencich worked one-on-one with attendees to give them free, personalized design advice on their rooms. Century Tile also raffled off a free Quick-Step laminate floor. “Consumers can feel so intimidated by the thought of selecting a new floor that they sometimes abandon the idea before even beginning the process,” said Elaine Carlson, vice president, Century Tile. “Erinn’s seminars offered very tangible design advice that showed attendees how doable and fun it can be to embark on a room refresh project, which includes a new floor. Century’s Tile’s experience and expertise then makes the selection and installation of this new floor easy and enjoyable for the consumer. Valencich said that Quick-Step laminate offers consumers the possibility to affordably create a big style change in a room. Many open-concept homes end up sharing living and dining spaces. In this photo, there is no natural separation between the two functional areas. It took several design decisions to keep this space feeling cohesive while creating a clear delineation between the two. Let’s see what choices work in this space. Color/material cohesion: The dining chair fabric appears again in throw pillows on the sofa. The dark metal base material covering the dining table’s legs also covers the small table between the two living area chairs. Finally, the wood flooring, window treatments and walls are consistent throughout the room. There is no attempt to turn this space into two rooms, which could make the room feel cramped. Area rug as divider: By choosing an area rug to define the living area, the separation is clear without using any space-absorbing options such as a bookshelf or buffet. The rug is large enough so that every piece of living room furniture is captured on it, further emphasizing the boundary. Dining room table choice: By choosing a rectangular table that matches the shape of the space available, the dining area is even more strongly delineated. 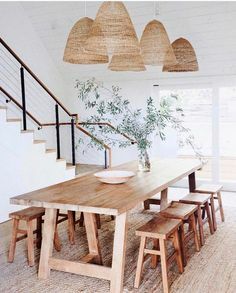 Add the chandelier and the two tall plants and it’s clear that the dining room stands on its own. The furniture choices and layout take advantage of the full scope of the room. They create separation without making the room smaller. Smart choices lead to a well-designed room that meets all of its functional needs. People often suggest searching through photos of rooms to help you design your own space. Instead, how about looking at works of art? Could you be happy with a bedroom that looks something like this painting? Well, let it inspire you as you plan your own space. First, the window appears to have a curved top, but actually that is simply molding and paint. If you’re not comfortable with your artistic capability, look for stencils that will meet your needs. The walls have a peach tone primarily, but cream and purple come in as light and shadow. If you want the variation visible here, you can do some faux work over a basic paint, or look for wallpaper that captures this impressionist style. Most homes don’t have window seats. But you can replicate the feeling by placing a cushioned bench or loveseat under a window. Add some floral throw pillows and the spot becomes a cozy place for looking outside or reading. The wing chair is an easy find, and almost any small ottoman could work with it if you cover both in the same fabric. Wide stripes are available in a variety of colors. You’re sure to discover one that will work in your room. For the dresser, look for something with a honey pine finish. Add antiquing or an additional sage green stain for the drawers and the knobs could be unfinished wood that you paint a nice cream or purchased pulls that suit your style. With this painting you have to guess at the flooring, so pick something that works well for you. Carpeting in light green, lavender or cream would work, or perhaps wood flooring with a few scattered area rugs in plain or floral patterns. Lots of possibilities! Every room in your home can be viewed in two ways: from inside the room itself and through any entryways to the room. These two photos demonstrate how important the view into other rooms is when you’re planning your home’s look. This home does have a strong emphasis on these transitions because of its design. You actually have four rooms visible at once thanks to the three French doors running in a row on the first floor. In spite of this strong connection, the designer did not make the mistake of decorating every room in the same mood. With the four rooms, there are four wall colors and styles. The entryway is in white and the sunroom a warm cream, while the dining room is a bright red with wainscoting and the living room has decorated wood paneling. So what keeps the rooms feeling connected? The main tool is the flooring. By selecting mid-tone wood across the first floor, every room has this common element to connect them all. The floor also shows the other connecting element – red Oriental rugs. Although the sizes and designs vary, this style carries and integrates every room’s design. Finally, furniture and accessories help make small connections. For example, the red cabinet in the entryway is the same hue as the dining room walls. That color is echoed again on the chair in the sunroom. This home’s design may be traditional, but it is still interesting and different. Take a look through your doors and see what you can do to make your transitions more interesting and effective. When you’re making one or more major design choices such as new flooring, furniture, or even when you’re choosing something as simple as a holiday accessory, sometimes the amazing variety of options can be challenging to sort through. If you find yourself haunted by bad decisions past, use this positive haunting approach to make good decisions in the future. Spend just a few minutes reviewing your final decisions, then walk away. Browse in another department, go to lunch or even take a day off. After you leave, does one choice seem to haunt your thoughts? Do you find yourself dwelling on one favorite tile vignette or visualizing one particular stone flooring in your own home? You’ve just been haunted by your best decision. You can then make your choice with much more confidence. After all, if your mind can’t let go of one image, it seems as though you’ve really already made your choice. So as you head back to that store or pumpkin patch and buy the pumpkin or flooring of your dreams, you know that you made the best decision. After all, you were haunted by the choice until you went back and bought it! Once you’ve made your selection, you may find yourself stepping back and admiring the option you’ve invited to be part of your home, whether it’s the flooring of your dreams, or even just a pumpkin for the season! 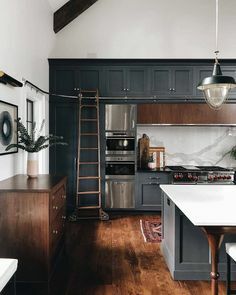 Here is one room that breaks most of the standard design rules, yet it’s interesting and vibrant, probably reflecting the people who created it. Sometimes having your home as a natural extension of who you are is more important than following the rules. In this case bright colors combine with neutrals in ways that shouldn’t work, but they do. The furniture is simply too big and too much for the room, but it still feels right. The accessories are so unique that they almost make the room feel uncomfortable, but instead it feels inviting. One reason this room works is the decision to keep walls, ceiling and window coverings a gentle off-white. Much of the furniture is simple and cream colored also. This helps a bulky element such as a grand piano less obtrusive. The carpeting is vivid and unusual, but the color in this room is limited to only a few other pieces. The use of creams, browns and blacks actually helps the rug feel more controlled than it would in a space with more defined colors. This is actually a good design idea if you can’t replace your flooring right away. Using a large area rug or even a bound piece of carpet over flooring that doesn’t match your style can disguise a floor problem until you can fix it. Finally, the number of unusual pieces is kept to a minimum, encouraging both the homeowners and guests to enjoy each element without feeling overwhelmed. Renovating your bathroom or kitchen? What are the most forgotten features homeowners fail to think about? Wouldn’t it be a luxury to have a heated floor? Cozy, comfortable and rich – don’t you think? Imagine waking up in the morning to an already warm room. Walk barefoot over a consistently heated floor – no cold spots! While heated floors sound expensive and ridiculously “un-green”, Nuheat’s recently introduced products will have you rethinking. Nuheat’s electric radiant floor heating system has received praise as a healthy and efficient zone-heating alternative. Nuheat’s pre-built heating system is not only easy to install, it is also features a 7-day programmable thermostat to maximize efficiency. Just heat when and where you want it. Nuheat allows homeowners to lower their central heating usage while still being comfortable. Instead of keeping your forced air heating system running throughout the entire house, Nuheat can actually reduce your home’s overall energy consumption. Another bonus – Nuheat does not generate any dust or air born pollutants.